I have been avoiding challenges for a while…not exactly sure WHY. Sometimes I don’t have the inspiration, sometimes I don’t have the supplies, sometimes I have a bad attitude. I definitely need to TRY to participate in challenges more often – they do make you stretch your creativity. The current Essentials by Ellen April 2017 Mix It Up Challenge is with Waffle Flower. I do have several of the new Waffle Flower Enveloper series stamps, but I reached for my only other Waffle Flower stamp set – In Every Way. And Essentials by Ellen’s Bold Blooms. I used my MISTI for every single image on this card. YES, it helped me keep my sentiment straight! I also used it for the flowers and leaves because I chose to use Distress Inks – which, in my experience are very blotchy with clear stamps. Mounting the stamps on the MISTI allowed me to stamp each flower, each leaf 3 times. And, voila! NO BLOTCHY IMAGES. Supplies: Stamps – Essentials by Ellen, Waffle Flower, paper – Neenah Classic Crest Solar White, Pop’Set Infra Violet, inks – Tim Holtz/Ranger Distress Inks Abandoned Coral, Twisted Citron, Wilted Violet, VersaFine Onyx Black, sequins – Pretty Pink Posh Sparkling Clear 3mm, embossing powder – Ranger Silver Pearl. 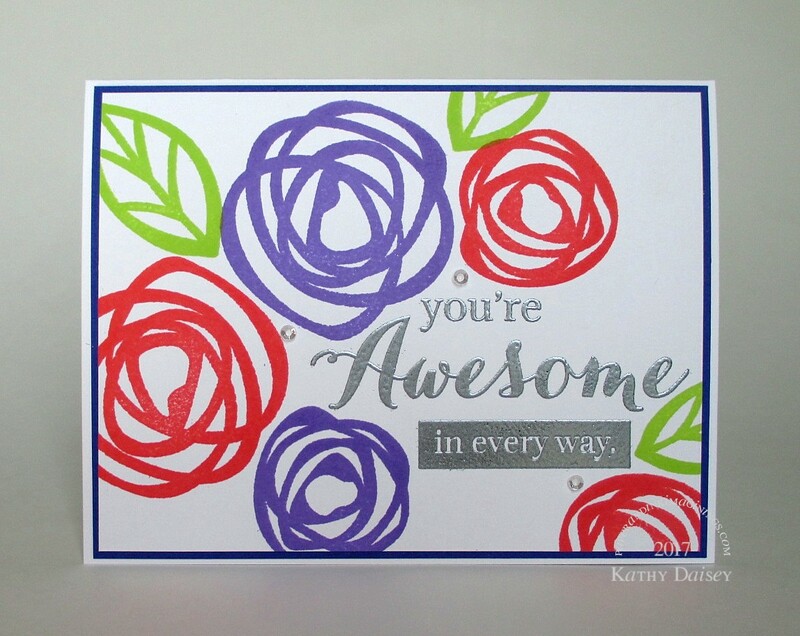 Categories: card, caring, encouragement, thinking of you | Tags: card, Essentials by Ellen, Essentials by Ellen Challenge, Neenah, Pop'Set, Pretty Pink Posh, Ranger, Tim Holtz, Tsukineko, VersaFine | Permalink. Flawless stamping and a great design. Good luck with the Challenge. Are there prizes? Hope you win if so! Gillian, there is a prize – $50 to Ellen Hutson, randomly chosen. Keep those fingers crossed!